The western pine beetle is a native bark beetle found in eastern Washington that can kill ponderosa pine, its only host in the state. In typical years, they hang around in low populations attacking weakened, diseased or older ponderosa pines. They are frequently found in trees weakened by root diseases, such as armillaria. When trees experience severe drought stress, as they did in 2015, the western pine beetle can more easily overcome the resin flow defenses of water-stressed trees. High numbers of stressed trees produce more beetle offspring and can lead to large outbreak populations. Aerial surveys in Washington recorded 12,900 acres with western pine beetle-caused mortality in 2016, more than double the amount in 2015, and the highest level since 2008. Typically, there is a year-long delay between beetle attack and visible crown symptoms. Drought damage can also have lasting effects on tree vigor and western pine beetle populations may continue to build, so mortality is likely to increase. The most recent large outbreak in Washington was 2003-2004, with over 120,000 acres affected each year. The pattern left on the landscape is patchy groups of orange or red ponderosa pines. This “group kill” is a result of pheromones used by the beetles to coordinate mass-attacks and concentrate beetles from the surrounding area. Female western pine beetles that make it past bark and resin will lay eggs in the sugary phloem layer of the inner bark in the main bole of the tree. Hundreds of their larval offspring mine in the phloem, disrupting the vital flow of sugars and girdle the tree. PHOTO 1: Western pine beetles can introduce bluestain fungi that grow into the sapwood, eventually causing tree death. Photo: US Forest Service. Western pine beetle also introduces bluestain fungi (See Photo 1) that grow into the sapwood and interrupt flow of water in the xylem layer, hastening tree death. In addition to copious resin flow that might fend off bark beetle attacks, healthy trees are induced by attacks to actively produce high levels of terpenes which can be toxic to bark beetle larvae. This response is reduced in weakened or stressed trees, resulting in higher beetle reproductive success and a larger “brood.” To make matters worse for the trees, western pine beetle can produce up to two overlapping generations per year in Washington. 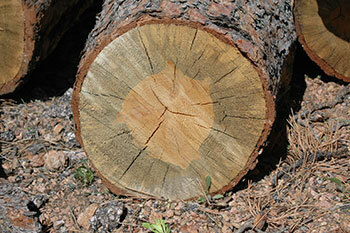 There are three other species of bark beetles that may aggressively attack and damage ponderosa pine. Mountain pine beetle occupy the same niche as western pine beetle in the main bole, but mountain pine beetle outbreaks in ponderosa pine are more likely to occur in higher elevation areas near lodgepole pine, its preferred host. The red turpentine beetle prefers to attack the lower eight feet of the main bole and ips pine engravers can attack smaller diameter tops and branches. It is possible to find all three species in the same tree. These double- or triple-whammies will certainly decrease chances of tree survival. 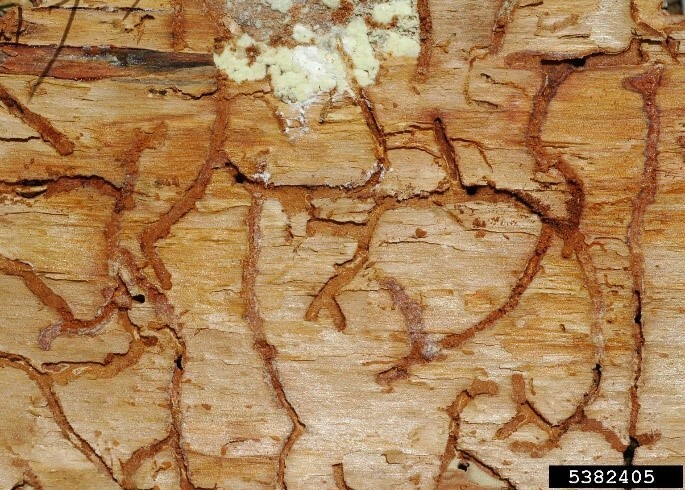 Successful western pine beetle attacks are easy to identify and differentiate from the other bark beetle species. Since western pine beetle is the only one that pupates in the outer bark, their larvae, pupae, and newly developed adults are easily accessible for predators, such as woodpeckers. Look for patches of bright orange bark where woodpeckers have flaked off the darker outer bark, a tell-tale sign of western pine beetle activity. Popcorn-sized pitch tubes may be visible on the bark surface, but these are less common than with mountain pine beetle. The surest way to confirm western pine beetle is to remove a patch of bark and look for the winding, serpentine egg galleries in the layer between bark and sapwood that do not change in width (Photo 2). When new brood adults emerge from the tree, they leave behind perfectly round exit holes a few millimeters across. What Can Landowner Owners Do? Orange crowns will certainly get the attention of landowners who will want to take action to manage the problem. Keep in mind that the crown often dries out the season after beetles killed it, so they may have already moved on. If exit holes are present and numerous, nothing will be gained (in terms of managing beetle numbers) by tree removal. Trees with green crowns that have woodpecker activity or pitch tubes with no exit holes may still contain beetles. Removal of these “green attacked” trees may help reduce beetle populations. During an outbreak, this approach is likely a losing battle since beetles can fly in from nearby areas. The best management practice for bark beetles is to control competing vegetation and increase vigor and resilience of the healthiest trees in a stand. Direct control methods such as pesticides can be effective in preventing attacks to high value trees but will do nothing to save a tree that’s already infested. There is a commercially available pheromone called verbenone that is marketed as a pine bark beetle repellant. Verbenone can be effective with mountain pine beetle in some situations, but for western pine beetle and ips pine engravers, the current formulation hasn’t worked well in field testing. Ponderosa pine mortality from western pine beetle may be high in some areas, but keep in mind that due to the patchy attack pattern, landscape level effects will be lower than with mountain pine beetle. Eventually outbreaks will collapse as drought conditions improve and beetles have fewer weak trees to support high populations. In addition, more beetles start dying as they try to survive in healthier hosts. If you would like assistance with bark beetle identification or ideas for their management, please contact the Washington Department of Natural Resources Forest Health Program at 360-902-1300 or forest_health@dnr.wa.gov. This article originally appeared in Small Forest Landowner News, published by DNR. Sign up for a free subscription and see other free DNR e-newsletters.